It's a worm! With a face made of worms! No? A tentacle with two tentacles? Two worms sharing an enormous tentacle? Oh, of course! It's a worm with two tentacles sticking out of its face. I knew we'd get there in the end. Spionidae is a family containing several hundred species of these tentacle-faced polychaete worms. 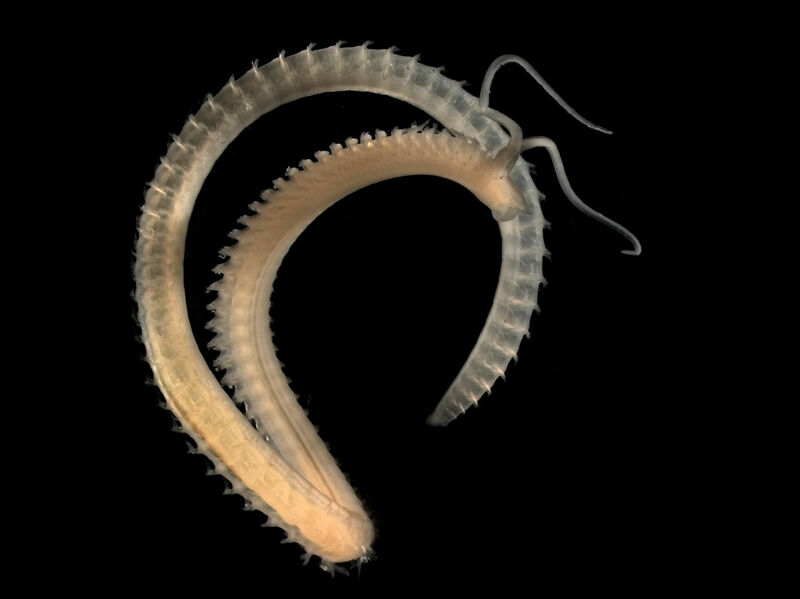 Most of them live in sandy or muddy sediment of marine waters across the world, from the intertidal zone to the deep sea. A few make it in brackish or even fresh water. Many of them simply crawl about in the sediment, taking each day as it comes. Other, more forward-thinking species prefer to construct a tube-home out of mud and mucus. If anyone's going to make a home out of mud and mucus, it's a worm. Still other Spionids must have tiny drills because they manage to excavate their homes out of limestone. The rudest of the lot are like squatters, burrowing into the shells of living molluscs. Wherever they live, they keep most of their body hidden from view and extend their long, flexible tentacles into the water or along the ground around them. 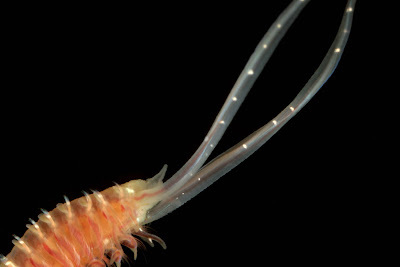 The tentacles bear grooves with waving cilia inside to bring specks of food to their mouth like tiny conveyor belts. 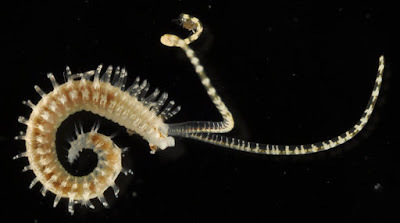 Most Spionids are small, like 3 cm (an inch) long or less, and extremely slim. Though the bigger ones can reach 15 cm (6 in) long. Either way, there's always something out there willing to eat a worm no matter how small and covered in mud and mucus it is. To combat this, Spionid tentacles can fall off easily to act as a distraction while the rest of the worm makes an escape. Therefore we're left with this bit of wisdom: it's better to be one worm with two tentacles, than two worms with one.